Do machines dream of electric malware? We've explored Google's anti-malware processes several times recently, as well as our efforts to work with webmasters to help protect their users. However, there's been some confusion about the objectivity of our scanning and flagging procedures. Google uses fully automated systems to scan the Internet for potentially dangerous sites. These systems help detect sites infected with malware and then add a warning that appears in Google search results and in many web browsers. We flag sites in this way to help protect users who might visit them. The warning is a cautionary page, and we never prevent users from viewing the affected site if they choose. It's important to note that sites are often compromised without the webmaster's knowledge, so we provide affected webmasters with further information on the issues we've identified — including showing snippets of the malicious code we find. We also offer free resources in Google Webmaster Tools to help site owners clean their sites and request a re-scan. Site owners sometimes say that we've made a mistake and that their site does not contain malware. For example, the recent appearance of a malware warning on people.com.cn sparked discussion about how Google flags websites. Our scanners — which are automated and indifferent to a site's subject matter — first found a malicious ad on the book.people.com.cn domain at approximately 3:47 a.m. PT on October 17, 2009. Over several days, the scanners detected thousands of URLs with suspicious content in other people.com.cn domains. Malicious content can be very difficult to detect. 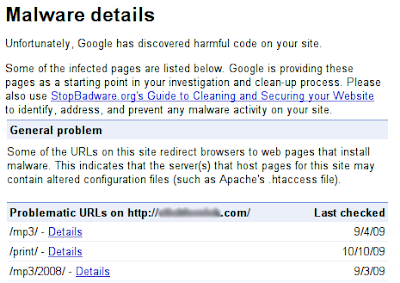 A previous post on this blog offered tips for finding hidden malware and cleaning up websites. There are also good tips on Google's Webmaster Central Blog. If a webmaster has indeed removed the malicious content and filed a malware review request in Webmaster Tools, the warning label will be removed shortly. If it persists, however, it's very likely that dangerous content remains. Our scanners are highly accurate, and false positives are extremely rare. If your site was compromised, it's important to not only remove the malicious (and usually hidden) content from your pages, but to also identify and fix the vulnerability. We suggest contacting your hosting provider if you are unsure of how to proceed. StopBadware also has a resource page for securing compromised sites: http://www.stopbadware.org/home/security Once you've secured your site, you can request that the warning be removed by visiting http://www.google.com/support/webmasters/bin/answer.py?answer=45432 and requesting a review. If your site is no longer harmful to users, we will remove the warning. 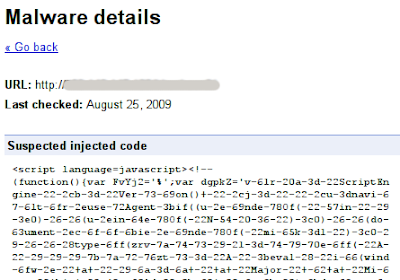 As the email says, the fastest way for a site to be removed from the malware list is for the webmaster to file a review request via Google Webmaster Tools. Google's automated scanners will periodically re-examine the site even if no such request is received, but the process will take longer. People.com.cn did not file a review request, but our scanners reviewed the site on October 23 and removed the malware warning after finding that the malicious ad was gone. Malicious display ads are an increasingly common way for sites to unknowingly distribute malware. We recently wrote about the steps that Google takes to help protect our advertising networks. Also, other publishers have recently written about their experiences with deceptive display ads. As part of Cyber Security Awareness Month, we're highlighting cyber security tips and features to help ensure you're taking the necessary steps to protect your computer, website, and personal information. For general cyber security tips, check out our online security educational series or visit http://www.staysafeonline.org/. At Google, we always aim to provide users with useful, relevant information. Readers of this blog know that we also work hard to detect malicious content on the web and protect users from harm. But did you know that we strive for the same level of relevance, and work equally as hard to protect users, in our online advertising business? The mainstream media has recently picked up on the topic of malvertising (malware-infected advertising). Google's Anti-Malvertising Team works hard in this area and would like to take this time to share some important safety tips. We work closely with the Anti-Malware Team to identify trends and improve automated detection systems. We also educate users, develop policies and act as a liaison between the online security and online advertising communities. Whether you're a web publisher who accepts ads on your website, or a home user who enjoys browsing the wide variety of advertising-supported content available on the web, we expect the resources below will help protect you from malvertising. "Malvertising" = malware + advertising. Haven't heard of it? The terminology may be new, but we can all understand the concept. Although malware distributors have attempted to spread malware through online ads for years, ever-improving prevention and detection methods have made it unlikely for most Internet users to have encountered a "bad ad" firsthand. However, it's important to make sure that you (and your computer) are properly prepared in case you encounter any source of malware on the web — whether it is an infected ad, a hacked site, a dangerous link, or someone who is pretending to be someone they're not. We created Anti-Malvertising.com earlier this year as a resource for all members of the online ecosystem. Anti-Malvertising.com contains tips designed for publishers, ad operations teams, and Internet users to help protect their websites, networks, and computers. Anti-Malvertising.com includes a custom search engine to help individual ad networks, publishers, and ad operations teams conduct quick background checks on prospective advertisers. It indexes a variety of independent, third party sites that track possible attempts to distribute malware through advertising. It is intended to be used as one of the steps in a publisher's background check process. In some recent cases, infected ads that had already been caught and publicized by security researchers have remained active within some advertising systems. Anti-Malvertising.com's malvertising research engine makes it easier for the online advertising and security communities to share information and collaborate to help protect users from emerging threats. Pay close attention to all agencies and advertisers with whom you work. Perform due diligence by thoroughly checking prospective partners' references and credentials. Perform comprehensive QA on all ad creatives. Protect your own computer and website from infection. Be aware that various ad networks and exchanges may have significantly different standards for the prevention and detection of malware. No automatic detection system, however robust, can substitute for your own vigilance. However, we strongly advise against exposing your site to harm by using networks or exchanges without strong anti-malware security measures in place. Ensure your Ad Operations team has an incident response plan in place (for guidance, visit http://www.anti-malvertising.com/tips-for-ad-operations). Make sure your browser, operating system, software and plugins are all updated regularly (enable auto-updates when possible). Be aware that malware can be disguised as antivirus/antispyware software in order to trick people into buying or downloading it. Fake (and harmful) software of this kind is known in the web security community as "rogue security software." How to avoid getting tricked? Always research a company's reputation before downloading its software or visiting its website, and be wary of unexpected warnings from products you haven't installed yourself. You can view a list of some legitimate free security scans at http://www.staysafeonline.org/content/free-security-check-ups. Exercise caution whenever you're prompted to download an email attachment, follow an instant message link, install a plug-in, or download an unfamiliar piece of software. In addition to providing visibility to advertisers, revenue to publishers, and information to users, the online advertising business model also enables anyone with an Internet connection to access an entire world of content for free. By increasing our vigilance as a community, we can help to keep online ads safe and preserve the wide access to information that advertising enables. As part of Cyber Security Awareness Month, we're highlighting cyber security tips and features to help ensure you're taking the necessary steps to protect your computer, website, and personal information. For general cyber security tips, check out our online security educational series or visit http://www.staysafeonline.org/. To learn more about malware detection and site cleanup, visit the Webmaster Tools Help Center and Forum. To help protect users against malware threats, Google has built automated scanners that detect malware on websites we've indexed. Pages that are identified as dangerous by these scanners are accompanied by warnings in Google search results, and browsers such as Google Chrome, Firefox, and Safari also use our data to show similar warnings to people attempting to visit suspicious sites. While it is important to protect users, we also know that most of these sites are not intentionally distributing malware. We understand the frustration of webmasters whose sites have been compromised without their knowledge and who discover that their site has been flagged. We proactively offer help to these webmasters: we send email to site administrators when we encounter suspicious content, we provide a list of infected pages in Webmaster Tools, and we maintain a service that allows webmasters to notify us when they have cleaned their sites. Read more about this process in the previous post on this blog. While we're excited to offer this feature, we caution webmasters to use the tool only as a starting point in their site clean-up process. Google's scanners may not be able to provide malware samples in all cases, and the malware samples may not be a complete list of all the malware on the page. More importantly, we advise against simply removing the examples that are displayed in Webmaster Tools. If the underlying vulnerability is not identified and patched, it is likely that the site will be compromised again. In addition to helping the webmasters of sites with malware warnings, this new detail is also designed to promote the general health of the web. In some cases, our automatic scanners find questionable content on a site but do not have enough data to add it to the malware list. The new "Malware details" feature will highlight these instances to webmasters early on to help them identify and address security vulnerabilities more quickly. We hope you never have cause to use this feature, but if you do, it should help you quickly purge malware from your site and help protect its visitors. We plan to improve our algorithms in the upcoming months to provide even greater coverage, more accurate vulnerability identification, and faster delivery to webmasters.